Doctor Philippe Longfils was born in Belgium where he studied medicine in Liege University, then “Tropical Medicine and Hygiene” in Antwerp. In January 1980, he arrived on the Thai-Cambodian border to work in Khmer refugees camps with MSF (Doctors without Frontiers) and other NGOs for 5 years. From1985 to 1991, Doctor Philippe worked in Thailand with IOM (International Organization for Migration): for Cambodian, Lao and Vietnamese refugee resettlement programs. From 1994 to 2005: “Medical Coordinator of MSF program” in Pakse, Laos, “Provincial Advisor for WHO” in Prey Veng, Cambodia and “Privincial Health Advisor with German Technical Cooperation GTZ (today GIZ) in Kampot, Cambodia. 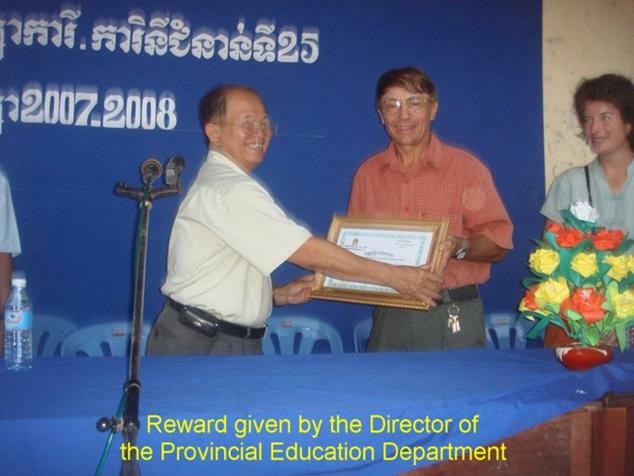 2006 to today, consultancy work and development of his small project to “Support Smart and Poor Students”. In March 2009, he received an award from King Father Norodom Sihanouk for his work in the Marcel Roy Foundation. In July 2013, Dr. Philippe received the Cambodian Nationality by a decree signed by HM. Norodom Sihamoni, King of Cambodia for his many years of work for the Khmer people. In January 1980, a young Belgian doctor arrived on the Thai/Cambodian border to work with refugees displaced by more than a decade of war and unrest. There he found unimaginable tragedy and privation, but he also found his life’s calling. He would never again call Belguim home, instead devoting his life to improving the health and education of Cambodian youth. JEN COWLEY recently spent time with the reclusive Dr Philippe Longfils. He’s been variously described by locals as eccentric, intense, uncompromising and brutally blunt, but there’s one thing on which all who know him agree. Around these parts, Dr Philippe Longfils is a legend. Here in the regional municipality of Kampot, Cambodia, the Belgian-born retired medico, humanitarian and philanthropist’s “slide nights” are as legendary as the man himself – and invitations to the irregular events are greatly prized. So I’m blessed to have scored a berth and I arrive with my local conduit at the famed 64 year old’s compound on the banks of the river just out of town, completely unsure of what to expect, but assured this will be an evening I won’t quickly forget. Longfils, or Dr Philippe as he’s affectionately and widely known, is best known for his work in the Khmer refugee camps on the Thai/Cambodian border in the early 1980s, and for his ongoing devotion to the improvement of the health and welfare of Cambodia’s youth. We’re greeted by a young member of Longfils’ Khmer staff, who ushers us through the lush tropical garden, still dripping from an earlier storm, and into a long tiled gallery that opens widely onto a grassed area sweeping down to the river. A small group of local ex-pats from all corners of the globe is gathered in the room, and as we enter the gaggle parts. At its centre stands a small man with a mop of brown hair and thick glasses – Dr Philippe. He has a warm, air-kissed greeting for my friend who introduces me as the Australian she was telling him about. The diminutive doctor sizes me up and raises a Gallic eyebrow. “Journaliste, uh?” he sniffs, but with a wry smile, and for some ridiculous reason, I feel compelled to apologise. A white wall of the gallery serves as a makeshift screen, complete with geckos, and the Dr Philippe show gets underway. The click of the old slide machine adds a nostalgic note as Longfils, his broad Belgian accent as thick as the soupy night air, gives a detailed and incongruously matter-of-fact account of his work with Medicins Sans Frontieres (MSF – Doctors without Borders) in Cambodian (then Kampuchean) refugee camps in the early ‘80s. The night is impossibly humid, but I ignore the sweat running down my back. Like the rest of the guests, I’m spellbound, horrified and fascinated. At once history lesson and horror show, Longfils tells of his experiences in the camps – of malaria and malnutrition, of land mines, of poverty and the politics that led to a humanitarian crisis few in the western world still fully grasp. But he also tells of the immense satisfaction such work brought to a young doctor. He speaks of indomitable human spirit and sheer will to survive and of Khmer people whose gentle and hospitable nature warmed his heart to the extent that he would never again call Belgium home. When the slides are finished he asks if there are any questions. I have dozens, but I’m at a loss for where to start. As his other guests make for the drinks table, he plops into a chair beside me. Now or never. I assure him I am “good journaliste” (not sure myself what is his yardstick) and ask if he would be prepared to do a story with me. He looks directly into my eyes for what feels like forever. Pictured: Dr Philippe treats a young Khmer boy at one of the refugee camps in 1981. Come Monday, Longfils is relaxed and cheery and meets us with a drink and a handshake, both of which are warm. The hour he promised quickly turns to two, then clicks on towards three. He’s open and honest and seems genuinely happy to share his stories and insights. I barely have to ask questions – it’s more a conversation that flows liberally through drinks on the patio, a three course meal and a tour of the compound. According to the bio on his humble website, Longfils studied medicine at Liege University in Belgium before specialising in tropical medicine and hygiene in Antwerp. In January 1980 he arrived on the Thai/Cambodian border to work in Khmer refugee camps with MSF and other Non-Government Organisations (NGOs) for the next five years. Then, until 1991, Longfils worked in Thailand with the International Organisation for Migration, concentrating on refugee resettlement for people from Cambodia, Loas and Vietnam. In 1992-93, he undertook a Masters in Public Health from a Bangkok university and from ‘94-2005 worked variously as medical coordinator of the MSF program based in Laos; provincial advisor for the World Health Organisation (WHO) in Cambodia and ultimately health advisor with GTZ, a German-based sustainable development organisation, here in Kampot where he has made his home since 1997. These days, there’s not much Longfils doesn’t know about health in South East Asia. But in 1980, he was an idealistic 30 year old doctor from pristine Belguim, so we start at the obvious question; what took him to those refugee camps? “I was always interested in adventure,” he says. “I was a student, playing a lot of sport and doing a lot of adventurous things. “Also, at the time in Belguim, we still had to do military service, so one way to avoid this was to do two years’ work in a developing country. “And anyway, I wasn’t very enthusiastic to go and sit in a private clinic waiting for patients,” he laughs. A brief break in Paris to meet a friend and see a Salvador Dali exhibition changed Longfils’ life. But at the time, Longfils says he had no idea of what had been or was happening in that part of the world. The infamous Khmer Rouge reign of terror in Cambodia ended, officially, in January 1979. Longfils arrived just 12 months later. It’s important to understand, he says, a little of the history surrounding the Cambodian struggle firstly under the Khmer Rouge, but later during the Vietnamese occupation of the country. “During the Khmer Rouge time very few people could escape Cambodia – a bit like in North Korea today – anyone who didn’t follow the communist Khmer Rouge rule was killed. “So the Vietnamese occupation of Cambodia allowed the people the freedom at least to run away. During the Khmer Rouge time, the people had been slaves and many were displaced. So the first thing they tried to do when the Vietnamese came was to return to their own homelands (villages) but there was nothing to eat. In the months after they returned to their villages, the famine took hold. Longfils explains that in mid-1979, just a few months after the fall of the Khmer Rouge, the Thai government pushed about 35,000 refugees back over the border into Cambodia – at gunpoint – to demonstrate to the rest of the world their unhappiness that not enough help was forthcoming from the international community. “From this first wave of refugees in late 1979, thousands died because of landmines placed along the border by the different factions of the Khmer Rouge from 75-79, and then by the Vietnamese to crush the Khmer resistance. “Once the Thai government began to push the refugees back over the border into Cambodia, the international community and the United Nations began to provide assistance – and when I arrived in January 1980, there were already 130,000 people living in refugee camps along the border,” Longfils says, leaning forward. I ask him to repeat that number. The young medico went straight to work, leaving mercifully little time to think about the humanitarian tragedy unfolding in that little considered corner of the globe. “At the time we were busy with the patients and didn’t have time to think about what was going on at the border. We were also some way away from the actual border, but at night we could hear the sound of the cannons, and the bombing and fighting with the different factions shooting each other. But the doctors would socialise with the Khmer medics and occasionally have the chance to visit some families in the camp. There, he says, they would hear stories from their patients. “Especially during the night duty when everything was quiet and they would begin to talk. “Many people who had been pushed back into Cambodia told horrible stories – like being at the bottom of the hill on the border and having to cross the field of landmines with the military coming behind them and pushing them at gunpoint. Many, many died and those coming after had to walk across all the dead bodies to cross the land mines. The grief and heartache for the people of Cambodia didn’t end with the Khmer Rouge. “No, it did not,” says Longfils over lunch. Many of those who were “lucky” not to be killed ended up in the camps, and in the “hospitals” along the border. Longfils surprises me with his insistence that, while primitive by western standards, the facilities were quite adequate for the needs of both doctor and patient. “Well, yes, of course they were basic. We were working in bamboo huts without air conditioning and limited facilities. But we had medicines and we had instruments, and it all demonstrated that you can do many good things with little means and that in the west they spend maybe too much for useless tests and medical activity. “In fact, many people were going to the border just to get medical care because at that time in Cambodia after the Khmer Rouge, there were maybe only around 40 doctors left – all the rest had been killed. Also there were no medical supplies in Cambodia at all, but on the border we had medicines,” he says. The doctor goes on to explain some of the difficulties he and his teams faced, including working in humidity to which they were not acclimatised and the staggering issue of infection control in a tropical environment without adequate sanitation. Trauma also and inevitably took its toll on patients, with many people arriving utterly exhausted from the long trek to the camps from across Cambodia with no food or water. Suffering physical and mental exhaustion, those who did not die along the way arrived very weak. But Longfils says that for many, just arriving at the camp was cause for a celebration of survival. Lack of access to nutritional food continued also to hamper their patients’ recovery, particularly a lack of protein, which led to iron deficiency. As an aside, Longfils explains that this iron deficit continues to plague Cambodians, and addressing the issue has been a major part of the raison d’etre for his work in the country ever since. In the refugee camps, people existed on a diet almost exclusively of rice, with the occasional small amount of fish. During his years in the camps, Longfils saw “many dead and dying” and there are “of course” many cases that stay in his mind to this day. He shows us photos of some of his patients and the images are haunting – particularly those that show the adult emotion and trauma in children’s eyes. There were also some particularly gruesome cases, he says, describing an incident in which one of the camp officials was brought to the doctors in the middle of the night, both legs “gone” from the impact of a landmine. “Oh yes, of course” says the doctor, as if having two legs blown off in the tropics 80km from a hospital would end any other way. I ask how they managed to keep emotion at bay under such trying circumstances, and he gives a characteristic shrug. The role of geo-politics in South East Asian conflict is widely acknowledged, if still little understood, and while Longfils says during the early years of his time in the refugee camps his focus was entirely on his patients, he clearly has a better grasp than most of the political machinations that led to the ongoing struggle of Cambodia’s people. “I was young and didn’t know too much about the events that happened before,” he offers. “One of the main concerns we had was when we were asked to go to work in the Khmer Rouge camp to treat their sick. When the Vietnamese came, the Khmer Rouge ran away and re-grouped on the border taking with them all the people who were with them at the time. Longfils tells of clandestine conversations with some of those “prisoners”. “At that time I could not speak Khmer, so we could not talk to the people. We had a translator, but all the time we had a Khmer Rouge officer sitting close by listening. Sometimes a medic would quietly whisper that they would like so much to come with us when we go, but they would be shot. Sometimes the Khmer Rouge would even forbid us to take very sick people with us to the hospital camp when we left. Warming to the subject of the conflict’s history, Longfils offers a blunt opinion, laying the blame for what would become the murderous Khmer Rouge regime squarely at western feet. Pictured: Dr Philippe has devoted his life to improving the health and welfare of Cambodia’s children: he is shown here in the late 1990s with some of the children to have benefited from the programs of the Dr Philippe Foundation. Longfils is on a roll now and expresses his concern over the dilution of traditional Khmer culture in Cambodia. “After the Khmer Rouge, we have 15 years of a communist system where the traditions from the past were “reorganised” in the communist way – Buddhism was not permitted, and all the traditional singing and dance were forbidden. And at school, of course the curriculum was all from the communist perspective. The same is true, he says, of Buddhist education, which has not been taught in schools for many years. It’s a refrain we’ve heard often on our travels around and work with communities in Cambodia, and Longfils is by no means the first to raise the concern of this country’s vulnerability to the influence of Christian evangelism. “The Khmer are very passive people and they are tolerant of this Christian influence – also because there is a lot of money involved with introducing and promoting Christianity. For instance a lot of NGOs were teaching English, but using the bible. We have more churches than pagodas in this municipality. I find this unacceptable,” he says, adding that Cambodian people have already lost so much of their culture and identity that the loss of their traditional religion will only exacerbate that loss. Our conversation turns to the United Nations, and when I ask Longfils’ opinion of the UN, his rolled eyes and dismissive hand gestures speak volumes. “The UN is the reason I am now retired. “When I was advisor to the WHO (the health arm of the UN) I saw that the organisation was just a machine for administration,” he says, launching into a litany of examples of bureaucratic frustrations, including a thwarted quest to implement a program he developed to increase the iron levels in Cambodian children. “It would have cost 500 riel per child per year (around 12c) – but because the WHO’s target group was only teenage high school girls with the menstrual period the program was never implemented. The only girls who were still in school by the time they reached puberty were the daughters of Chinese officials. The girls who were suffering anaemia were already left school and working,” he says, still exasperated that the data and sample group he was expected to use were next to useless. Bureaucracy and inflexible guidelines formulated with a lack of understanding of Cambodian society and demographics, he says, makes practical programs of any kind near impossible. Here on the banks of Kampot’s river, the Belgian-born doctor has found what he calls “near Nirvana”, and it’s a description of not only his physical surroundings but of his personally satisfying work with Cambodian youth. From here, Longfils runs the Dr Philippe Foundation to “support smart and poor students”. The long-time humanitarian firmly believes that every village, including the poorest and most remote, has “at least one child who has the opportunity to be the next Obama”. Sadly, as with many charitable organisations, the global financial crisis has impacted greatly on the foundation’s ability to gather support – so Longfils says he is concentrating now on the students he already has on his support program, to try to complete their education with the finite resources available. As we finish with our lunch, three rambunctious golden retrievers come bounding into the house, covered in with river mud. “Ah,” Longfils yelps with delight, bending to greet the trio in French and introduce them in English. He breeds the dogs, and points to one boisterous youngster he bought from another breeder to introduce a new bloodline. He reaches down to embrace the hapless creature. “No balls, but I love him,” he hoots. I ask, but I already know the answer. Will he ever consider returning to Belgium? “I have spent more than half my life here now. I have no reason to go back to Belgium. Many of my friends have already passed away because they enjoy too much the Belgian food, uh? And there’s also the climate! As we say goodbye, after the one hour interview that turned into a three hour visit, I ask him if he’s saddened by the conflicts that continue to plague the world, and by the repeated and prolonged displacement of so many innocent souls through war. He pauses, takes a deep breath and heaves a long sigh.